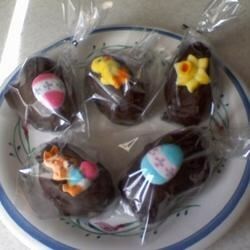 "I make these wonderful chocolate covered peanut butter candies in the shape of eggs at Christmas time. " In a mixing bowl, combine peanut butter and butter. Stir in confectioners' sugar and crisp rice cereal until a dough is formed. Place this mixture in the refrigerator for about an hour to allow it to cool until it is easier to work with. Shape mixture into egg shapes and freeze for 20 minutes. Melt chocolate chips and shortening in a double boiler over low heat. When melted, dip egg shapes in chocolate. Place on waxed paper and allow to cool. Perfect peanut butter and chocolate Easter eggs! These eggs were fund to make. Fairly easy (a bit messy) to prepare. I will try using milk chocolate chips the next time. Rolling them in coconut would be a fun addition. YUMMY!!!!! I made for Easter but since then I make these like buckeyes. The crispyness is great!